Nature Made TripleFlex Triple Strength with Vitamin D3 is a product for joint health, based on the most important ingredients for promoting cartilage function and the improvement of the synovial fluid that keeps the joints flexible, even later in life. Because it contains such strong ingredients, this product is a great recommendation for anyone wanting to lead a healthier, more active lifestyle. To see if this health supplement is what you are looking for, let’s take an in depth look at the ingredients and how you can benefit from their action. These figures are valid for one serving, or two tablets. The presence of glucosamine is a positive fact, because it is one of the most important ingredients to have in a supplement for treating aching joints. Also, chondroitin sulfate and MSM support the joint function and synergize well with glucosamine.Vitamin D3 is beneficial for bone and cartilage health, as well. Still, we see no other herbs included, although there are plenty of traditional remedies to draw benefits from, and there is no hyaluronic acid included, either. The latter can greatly improve the condition of the synovial fluid in the cartilage that maintains joints flexible. According to the manufacturer, you need to take two tablets daily, with food, and you must follow the treatment for four to six weeks in order to see results. The listing price for a bottle with 120 capsules is 39.99USD. Seeing that one bottle lasts for two months, this is a very good price. We did not see any refund or return policy showed on the manufacturer’s website, but you can contact them for additional details. Nature Made TripleFlex Triple Strength with Vitamin D3 is sold through resellers, so you can take advantage of their return policy. 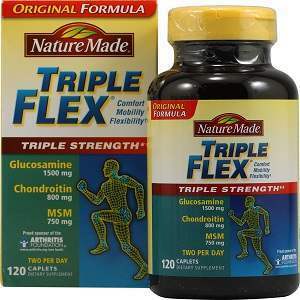 Nature Made TripleFlex Triple Strength with Vitamin D3 contains all the three most important ingredients for joint health, which are glucosamine, chondroitin and MSM. Together, these three ingredients have a positive impact on your joints and on their mobility, but, still, there are better formulas out there. For instance, this product does not contain any hyaluronic acid or herbal remedies that are also very effective for promoting joint health. Mark Stevens	reviewed Nature Made TripleFlex	on July 8th	 and gave it a rating of 2.5.